For over forty years in the school teaching profession, thirty seven years in Winnipeg; Charter and life member Manitoba Teachers Society; School Master Club; Manitoba Educational Association; Honorary Instructor, Royal Life Saving Society; Life member of York County, Ont. Historical Society; and for six years a member of the Winnipeg 90th Battalion; for many years a member of the Native Sons of Canada and from 1946-8 its President. These were but a few of the organizations to which he gave unstinted devotion. Such in brief was part of the life work of W. J. Sisler. 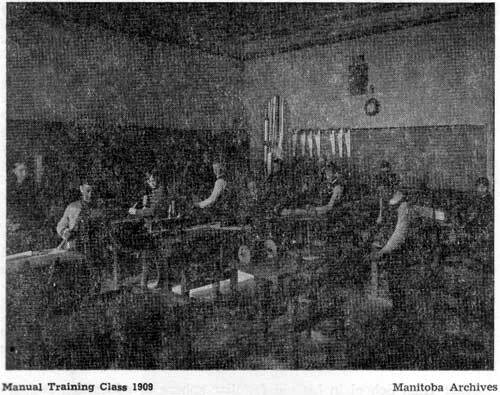 It was away back in 1901 that Mr. Sisler was appointed manual training teacher for the North Winnipeg schools. A host of affectionate memories arise in connection with his work at Machray School. He not only taught the use of plane, chisel, saw, square, etc. He was greatly admired for his kind and patient manner in that department, and did an outstanding job as coach of our soccer, football, lacrosse, and hockey teams, as well as an instructor of our cadet corps. Forty years after we won the north division championship at soccer, in 1904, we had a reunion of all old Machray students. To the members of the old team, Mr. Sisler was the most important person present. He remembered and recalled not only the nicknames, but our many and varied idiosyncrasies. He recalled various remarks made by some of the boys on the football field. Some of the remarks would not be regarded as complimentary in this day and age. William James Sisler was born in 1870 on a farm at Sharon, near Newmarket, Ont. His parents were members of the Quaker sect. He was educated there and when nineteen years of age came west, attended Wesley College and worked on construction for the Canadian Pacific Railway during the summer. He later obtained a non professional teacher’s certificate in Toronto and the B.Sc.Ed. degree in Chicago. In 1896, he started a three and a half year stint of teaching at Macgregor, Manitoba, later at Stockholm, Saskatchewan, and in 1901, while waiting to get on the Winnipeg manual training staff, he taught at the Old Kildonan school for a few months. His knowledge of the handling and use of tools was gained during his work for the railway. He also took courses in Wisconsin during holidays. In March 1905, Strathcona School in North Winnipeg was opened. Prior to this event W. J. Sisler was invited to become the school’s principal. He accepted and thereby assumed one of the most challenging jobs in the teaching profession. The enrolment was slightly less than 300 pupils but by the end of the third year there were nearly 900 crowded into a building meant to accommodate not more than 600. In a group of 1905 students who were pictured in his book, five spoke English as their mother tongue. Twenty-two countries of origin and eighteen language groups were represented. The unswerving devotion to duty by the young and ever patient teachers under Mr. Sisler’s supervision, deserves high commendation. They not only taught the pupils the English language and the three R’s but coached them in games, music, dramatics, gardening, knitting, sewing and clay modeling. All of these activities could be related to language teaching and for many of the children school was the bright spot in their lives. Some of the teachers were very young and with but little teaching experience, “but enthusiasm and good nature counted much more in our classrooms than did long experience…we had to devise our own program. We taught speaking, reading, writing and spelling through the medium of objects seen and actions done in the schoolroom, on the playground, on the street or in the home. This was done directly if possible but in the case of objects and actions outside the environment, pictures were employed”, and, “at the same time they were learning to read, write, sing and play games and do some art work”. 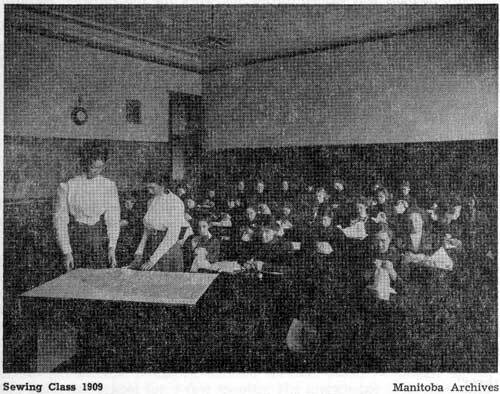 By 1916 the Provincial Government decided that all schools in Manitoba were to adopt Mr. Sisler’s method of language teaching and in July and August of that year about 50 teachers attended classes at Strathcona School to fit them for the new departure in language teaching. The methods developed at Strathcona were carried to country districts and the multilingual plan was discarded. “The children were freed from the handicap of broken English and within a few years spoke as well as did those in English speaking districts”. Throughout the arduous years of his profession, Mr. Sisler continued to coach football, lacrosse and baseball teams. In this book there are pictures of sixteen teams with Mr. Sisler, their coach, winners of soccer, football, lacrosse or baseball honors. The first of these pictures was taken in 1909 and the last in 1930. Nine were from Strathcona School and seven from Isaac Newton School. 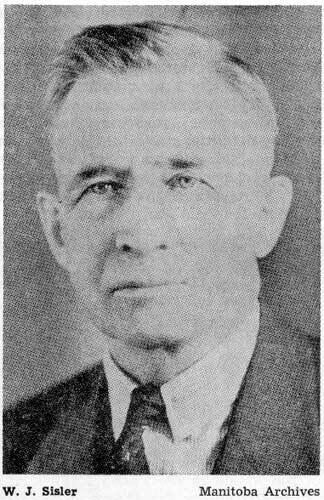 Mr. Sisler was principal of Isaac Newton High School from 1921 until 1938 when he retired. The year 1921 was important for another reason. In that year he married Miss Ellen Martin, who was his helpmate and inspiration for the balance of his life time. She had also followed the teaching profession before her marriage. It is interesting to note that when Strathcona School at McGregor and Burrows Streets opened its doors it was near the centre of a sparsely settled district of dairy farms and market gardens with a narrow fringe of houses along the C.P.R. yards. Twenty years later the peaceful invasion of immigrants locating in the district had required the erection of nine new schools. In 1965, there is one high school, Sisler, and fourteen elementary schools in the same district. Isaac Newton is now operated for grades 7 to 9. W. J. Sisler’s interest in immigrants to Manitoba went much beyond the north west section of Winnipeg. Many of his summer vacations prior to 1921 were spent visiting the newcomers in the north and west areas of Manitoba. His intense and devoted interest in the welfare of these new Canadians is indicated in the wealth of material assembled by him, in the Provincial Archives, available for research and study. Among the documents are many pictures taken by him of people on their farms, showing them at work with what today would be regarded as pioneer implements. He also committed to writing what he learned from them as to their desires and ambitions. In many cases the husband worked as a laborer, wherever he could get work. The wife did most of the farm work. I have seen some of the farms in northern Manitoba and could hardly conceive that in a few years, the land dotted with stones, large and small, bush and scrub, could be converted, by dint of honest and hard labor, into grain farms unexcelled anywhere. One of the immigrant farmers when asked his reason for coming to Canada, replied, “To work, to live in my own way, and to give my children a better opportunity in life”. A farmer’s wife when asked if she needed help, replied, “Healthy people don’t need help”. These remarks could be regarded as the basis upon which the old time immigrant became an independent and very dependable Canadian. Subsequent to Mr. Sisler’s retirement in 1938, he spent untold hours in promoting good citizenship in various ways. One of his undertakings was the teaching of R.C.A.F. classes in Elmwood. Another was the many hours, with his friend J. Kerr Brown, spent with the Winnipeg Parks Board to promote playground areas for the children. A few months spent in Old Kildonan were some of the happiest in his long career. He had a very high regard for the Selkirk settler descendents. He now rests in peace in the family plot in the cemetery founded by the original Selkirk settlers. The Winnipeg Free Press editorial of 16 August 1956, a week after his death, said in part, “wide ranging in his interests, he touched Canadian life at many diverse points; but there was something unique and memorable about his achievement at Strathcona. It was an achievement in creative citizenship. His life has become part of the biography of Winnipeg.” The man whom we at Machray School so greatly admired and respected, over sixty years ago, became one of Manitoba’s most notable citizens. He will never be forgotten by any of his former pupils. Sisler High School in his old familiar sphere of education honours his memory and his outstanding contribution to education. It was built and opened one year after he had passed away.